Holy s***... The dolphins in kaikoura are insane. See, I went out swimming with the dusky dolphins today. What they do is they hook you up with a wetsuit, breif you a bit on what to avoid and what to do and then you go out on a boat to where they've spotted the dolphins. The unique here is how friendly they are and how often they are found. Keep in mind, they are fully wild so the only reason you get to swim with them is because they like to scare and play with tourists... And true enough, we went out like 15 min by boat and jumped in the water when they found a pod. 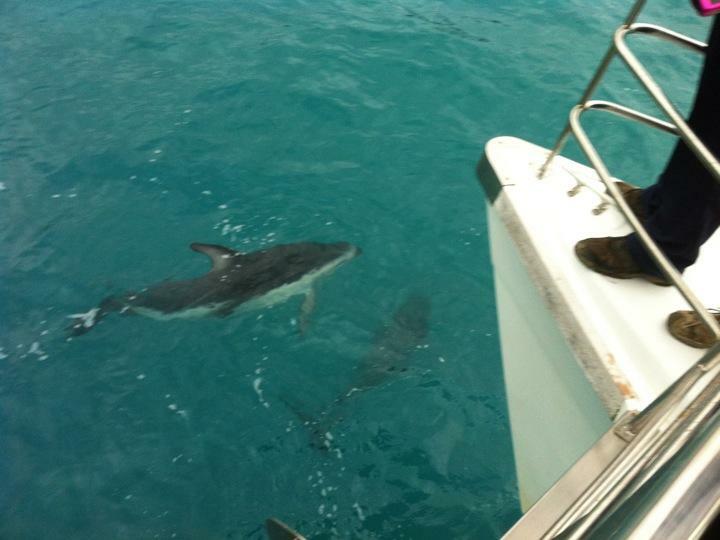 Plus anytime you dived down, the dolphins instantly picked up interest in you. Thing is, you couldn't see more than like 5 meters, and five meters doesn't take long to cross for a dolphin. So you got down a few meters, and in just a few moments you could have ten to fifteen playful mammals rushing towards you and you didn't see s*** until they were almost in your face. At one time I got down a bit further and when I started ascending, one of them followed me up, noticably slow so that I could keep up. When I reaches surface though, he started circling around, and I tried to spin around with him. We actually kept this up for a while, and then he started to paddle of and I followed. He stayed slow still so he wouldn't lose me to quick. And he really kept eye-contact, or well sort of at least. This was really an awesome moment, playing around with a dolphin that was playing around with me even more. I have no idea how long we were in there, but after a good, long while we were called up out of the water. We got some hot chocolate and ginger cookies to stove of the cold and sea-sickness. Then we followed the pod around so everyone could get a good picture. By noon we were all home on land and happy as a clam. This would be a good day alone, but when I got home to the hostel, a few people were going up to watch seal cubs play in the ohau waterfall. Although this time I forgot me phone, so no pictures of adorable little fat furballs playing in the water or sunbathing. Then I got the bus back to christchurch and will spend tomorrow in the most destroyed city in new zealand.